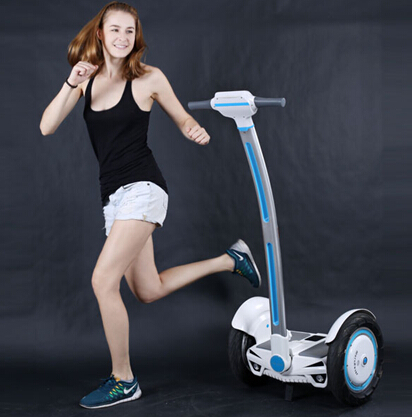 Zero emission & no pollution All the power source of Airwheel S3 comes from lead acid battery, and it is convenient to charge by using power supply for household. You can enjoy driving about 30-35km at the speed of 10km/h-18km/h after charging, without any emission or any destruction to the environment. High efficiency Circular energy reserving system is another sparkle of Airwheel S3. By utilizing the control module of gravity, Airwheel S3 can brake and stop by judging the center of gravity rather than configuring a traditional brake system based on friction. And as a result, during the process of deceleration, kinetic energy converts to electric energy being stored in the battery without losing any heat energy due to friction. In a word, there is no energy waste. 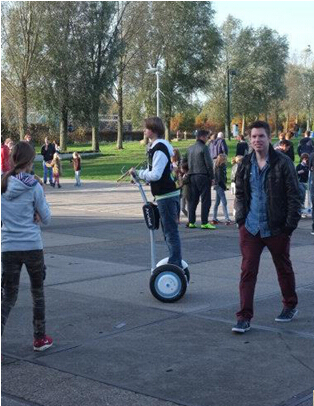 Ideal Selection Airwheel S3 is an ideal and advanced travel tool in an extremely crowded city because of its small size, reliable security and unique driving technology. The innovation of its structure design is based on the principle that “A little body often harbors a great soul”. With the fast development of modern metropolis, Airwheel S3 is now being accepted as a superb solution for individual traveling.